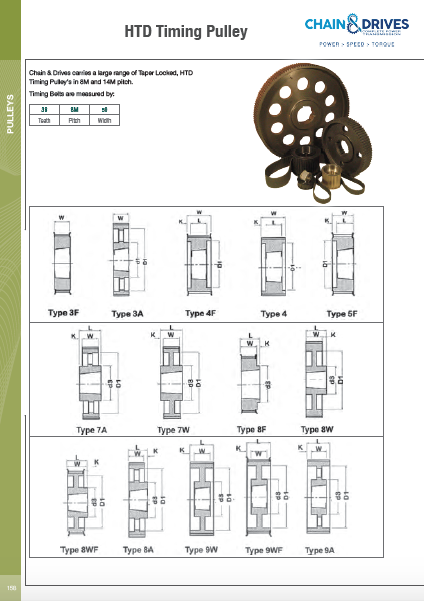 Chain & Drives stock all types of pulley products including SPA, SPB, SPC, SPD, 8V, A & B section. 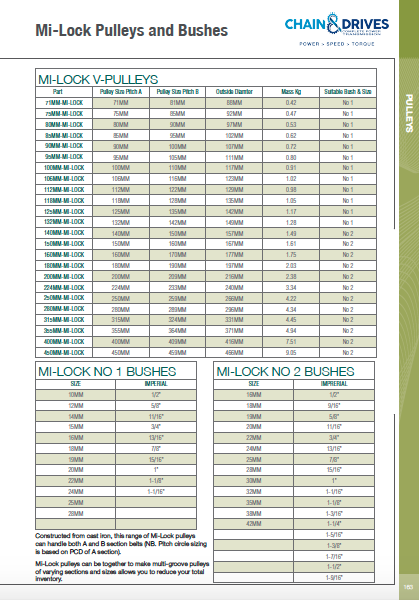 Pulleys are dynamically balanced and suit standard taper lock bushes. We also supply industrial timing pulleys to suit HTD timing belts. We also offer special designed and manufactured pulleys to meet your requirements. The Standard Vee Belt Pulley drives have been around for more than 50 years. It is used in many applications throughout industry and is one of the most recognised power transmission drives ever made. Belt Drives are used for high speed high power applications including: Pump Drives, Fan Systems, Blowers, Crusher Drivers, Agricultural Equipment, Lawn & Garden Equipment and Automotive Drives. Our Pulleys are available in single and multi strand (up to 12 grooves) in standard Pitch Circle Diameters (PCD) from 63mm up to 1250mm. 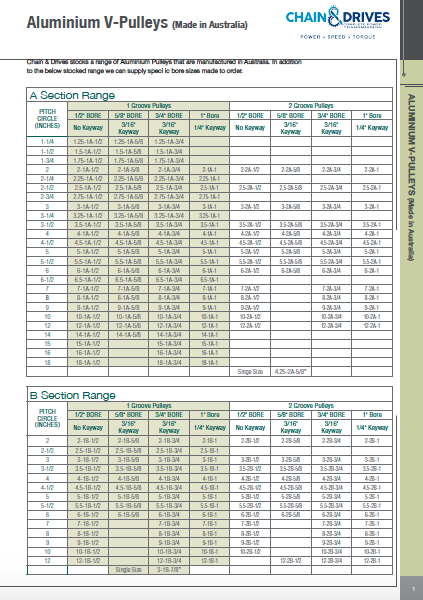 They are available in the 4 standard SPZ, SPA, SPB and SPC section belts in Vee and Cogged X design. 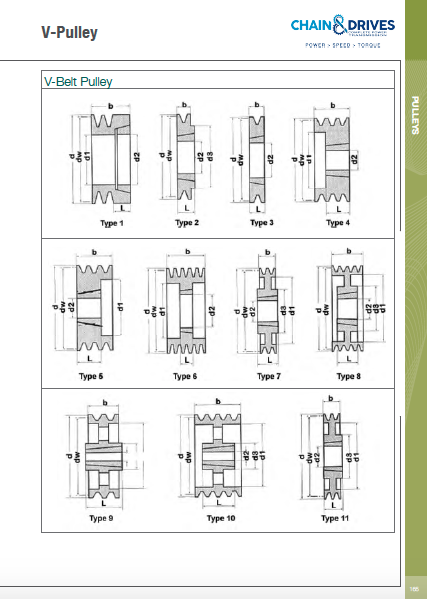 Standard Taper Fit designs accommodate a huge range of imperial and metric bore. Taper bore hubs available in stock for immediate delivery. Light weight taper lock design allows easy installation onto shafts and simple removal for any future maintenance requirements. Manufactured from high quality cast iron materials meeting international standards. High quality castings are dynamically and statically balanced, ensuring maximum service life in new and replacement applications. 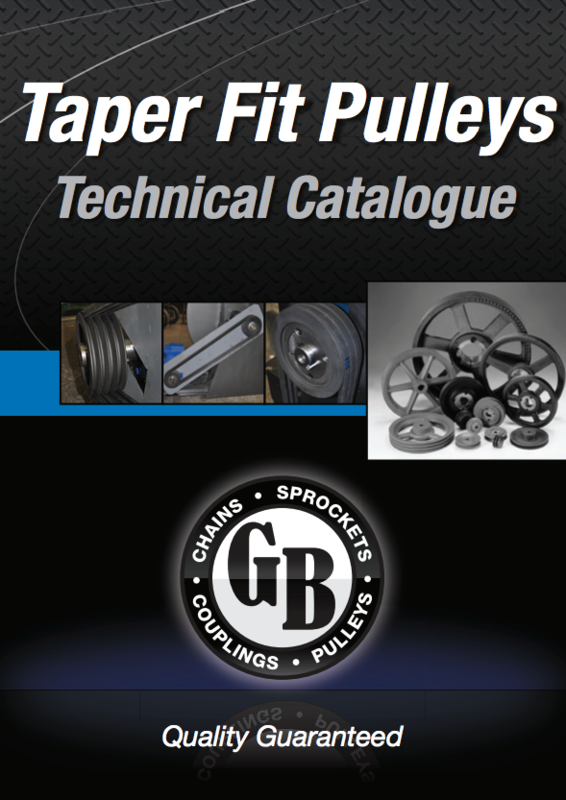 The latest Pulley and Taper Fit Bush technical reference catalogue is available for download from our website. The SPA, SPB, SPC and SPZ series is the new and improved version of the Vee Belt drive. It is capable of greater power than the standard A, B C&D section, giving a more compact drive. For further information or help in selecting a drive contact us today. 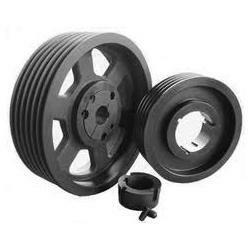 We stock all types of pulley products: SPA, SPB, SPC, SPD, 8V and A & B section. Pulleys are dynamically balanced and suit standard taper lock bushes. 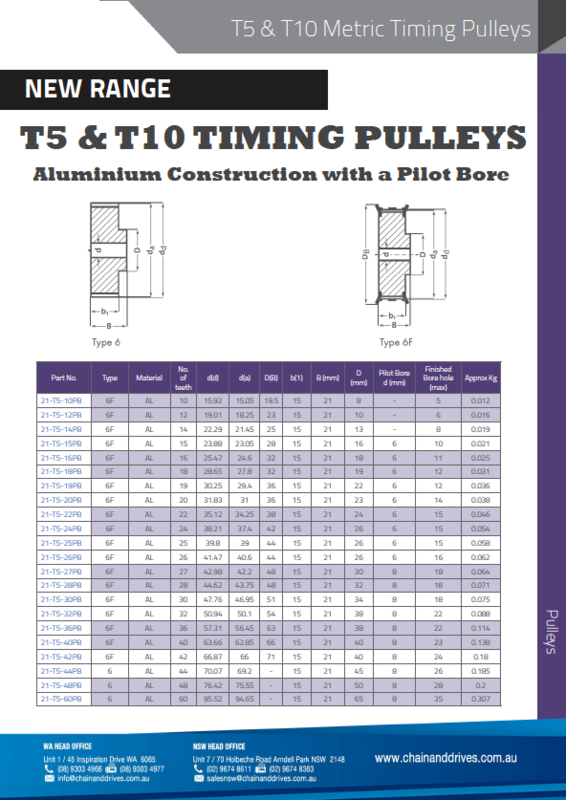 We also supply industrial timing pulleys to suit HTD timing belts. Our in house CAD design team offer specially designed and manufactured pulleys to meet your requirements.